Experience the sleek, lightweight design and crystal clear audio of the EAR FORCE Recon 50X gaming headset. With 40mm Neodymium speakers and in-line controls, the Recon 50X conveniently places Mic Mute and Master Volume at your fingertips, and you can use the high-sensitivity adjustable boom mic for in-game and online chat, and then remove it when listening to music and watching movies. 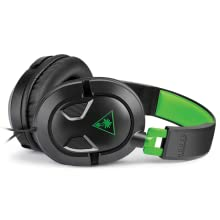 The EAR FORCE Recon 50X is designed to connect directly to the new Xbox One controller with the 3.5mm headset jack, and to other Xbox One controllers via the EAR FORCE Headset Audio Controller (sold separately). 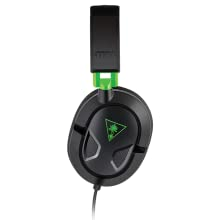 The Recon 50X will also work with the PlayStation 4 controller, PC, Mac and mobile/tablet devices. 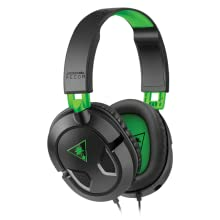 Complete Features: Lightweight & Comfortable Design The sleek, lightweight over-ear design with synthetic leather-wrapped ear-cups allows you to play for hours in complete comfort. Crystal Clear Chat & Audio Use the high-sensitivity adjustable boom mic for in-game and online chat, and then remove it when listening to music and watching movies. Full-Range Speakers Large 40mm Neodymium speakers deliver great stereo sound with crisp highs and thundering lows. 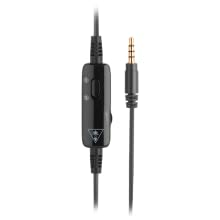 Convenient Controls In-line controls conveniently place Mic Mute and Master Volume right at your fingertips. Highly Versatile Compatible out-of-the-box with the new Xbox One controller, and with other Xbox One controllers via the EAR FORCE Headset Audio Controller (sold separately). The Recon 50X will also work with the PlayStation 4 controller as well as other devices with a 3.5mm audio connection, including PC, Mac and mobile/tablet devices. Take comfort (and your game) to the next level with the lightweight Turtle Beach Recon 50X headset. Beyond the comfortable over-ear fit and ear-cups that rotate flat, the large 40mm speakers deliver incredibly crisp sound. In-line controls allow you to adjust volume or mute the mic with a finger and removable mic makes it easy to go radio silent, listen to music or watch a movie instead. Universally compatible with Xbox One controllers, PC, Mac, mobile devices, and PlayStation 4 via the 3.5mm jack. Older consoles may require the Headset Audio Controller (sold separately). Works great with Xbox One controller with the 3.5mm jack, PS4 Pro and PS4, as well as PC, Mac and mobile/tablet devices with a 3.5mm connection. The Recon 50X features Turtle Beach’s latest lightweight and comfortable design, and is perfect for those long gaming sessions.